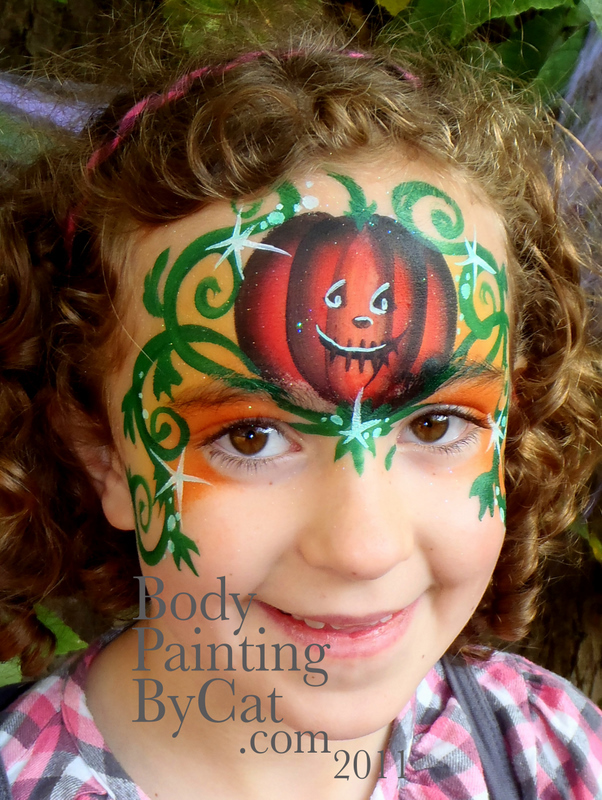 October is the busiest month for face & body painters, so if you’d like me to paint at your party, club night or event, or need painting or prosthetics as part of your costume, book NOW. 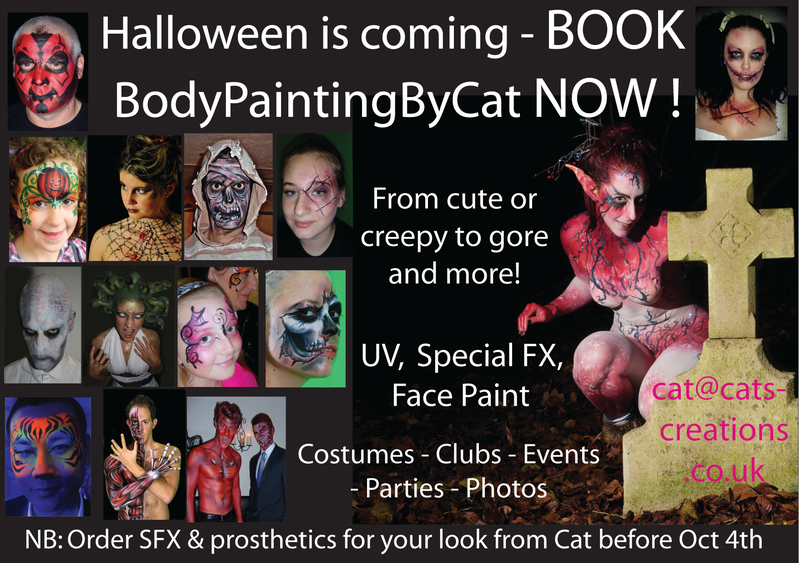 If you would like any special effects or prosthetics included you also need to discuss that with me so I can order them before Oct 4th. I’m thinking of booking a space in somewhere central and taking bookings/ walk-ins all day too…. if you know a suitable venue or would book in please say! Oh I LOVE getting to do the more imaginative stuff, especially to go with people’s outfits so the whole costume is completed! 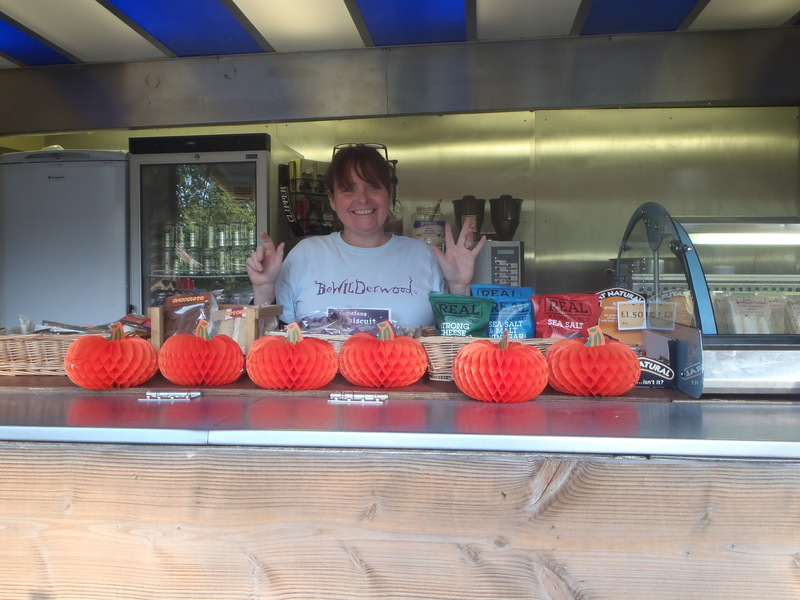 Tis the busiest season of my year – Bewilderwood and kids events/ parties most days, and clubs/ private party bookings in the evenings! 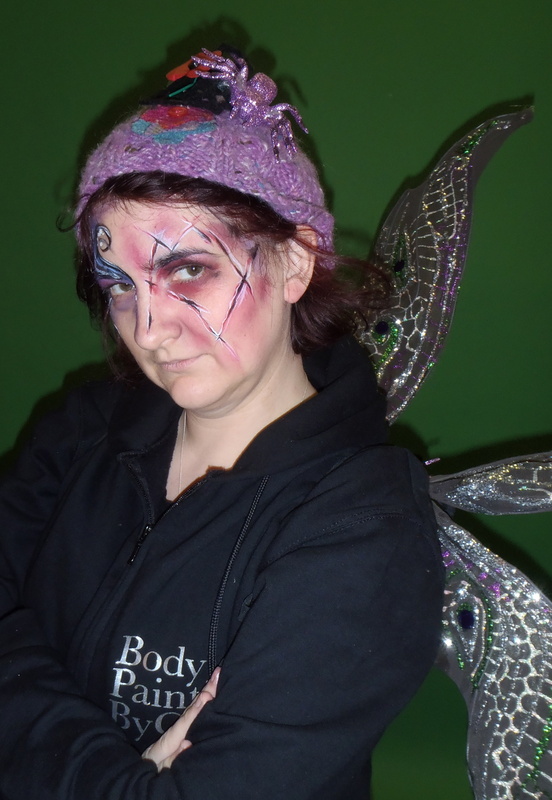 First up we have Di of Frozen Photography who wanted a scary dead doll. 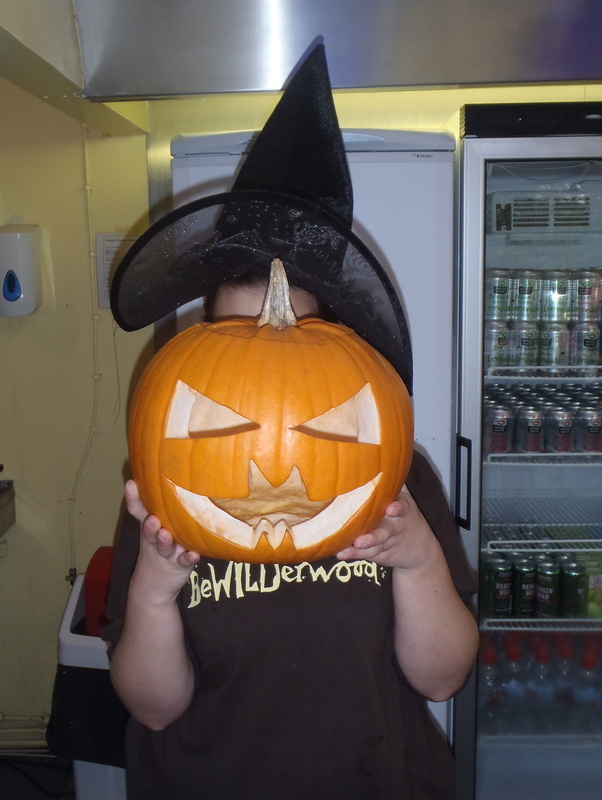 When asked if cute scary or really scary she chose the latter… and on seeing herself in the mirror decided she would get changed at her mates so as not to freak out her boys at home! Then a truly gruesome flayed werewolf for lovely Joe the wood worker/ tree person from Bewilderwood. 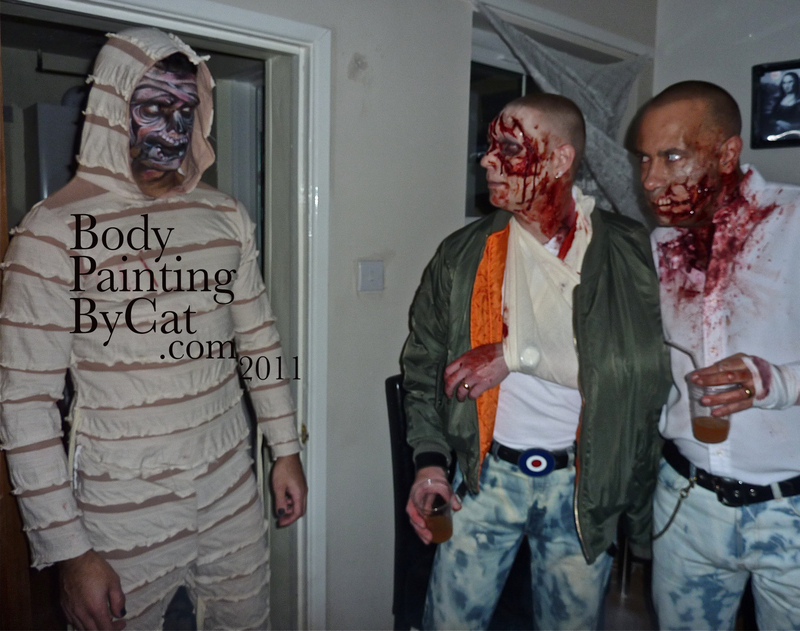 Then I did a lovely bunch at a party I do regularly – zombies mainly. 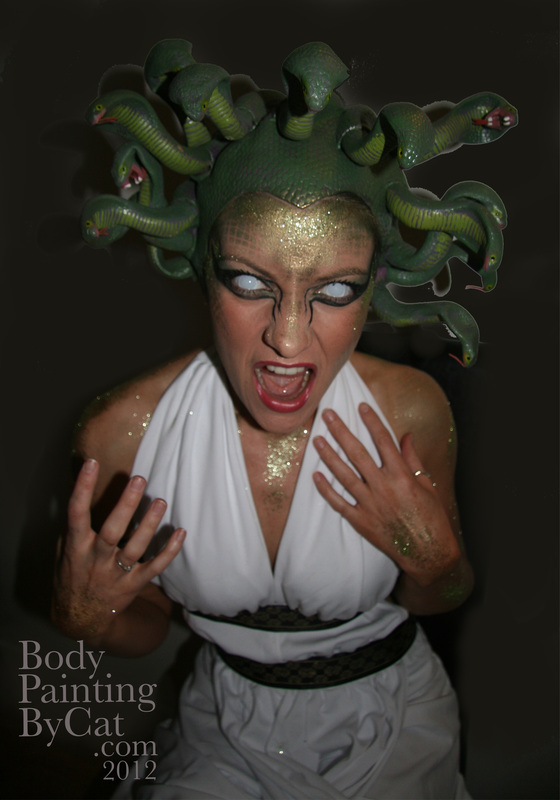 This year the hostess went for an evil meduse look, with glitter tattoo scale effects and face by me and freaky contact lenses. Host Josh had asked for some elaborate prosthetics and a bald cap which I ordered from Ebay, and glued on with cosmetic adhesive. 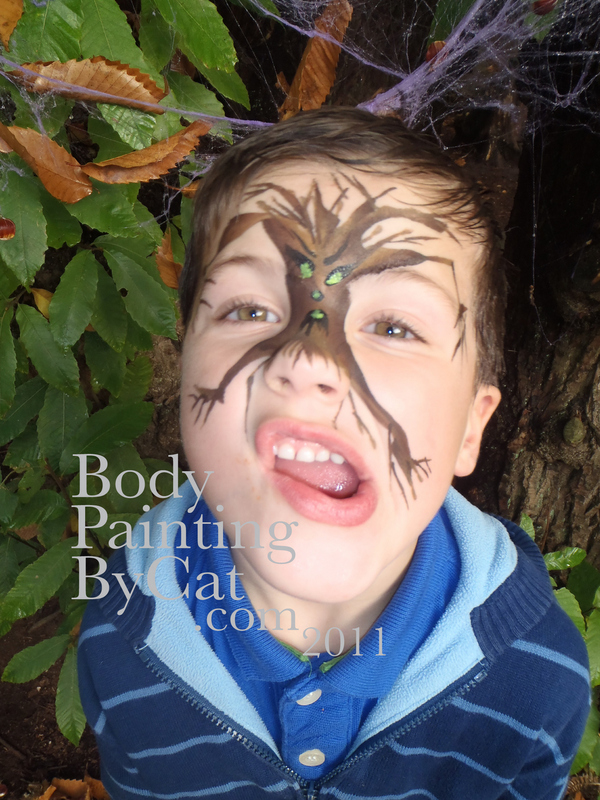 Then we painted him… he decided not to use the slip-on black prosthetic forked tongue! 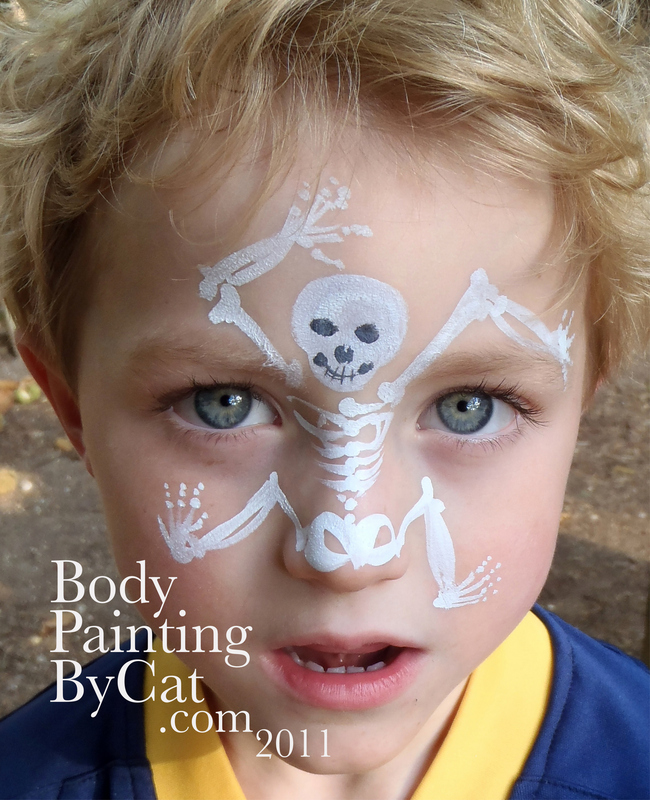 Remi & Josh have kindly had me over to bodypaint them before their Halloween party for the last 2 years. 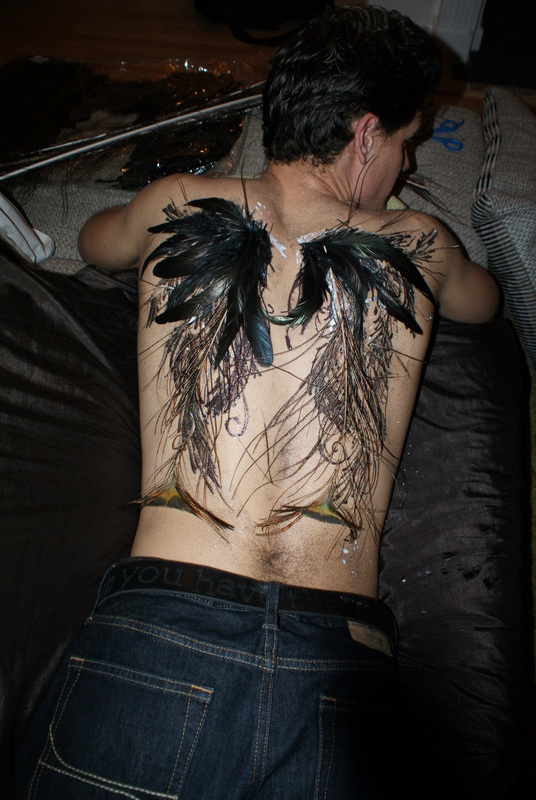 This year Josh went for a Fallen Angel look – I made wings on his back using freehand body glitter tattoos, and glued a range of types and sizes of feathers (peacock with no eyes, black-gold cockerel feathers, maribu fluff etc). I then made his face look a little hollowed out, added some quick tribal tattoos and sprayed him all over with a misting of metallics. Remi had a rather snazzy ‘mummy’ suit, a stretchy ribbed looking bandage affair. 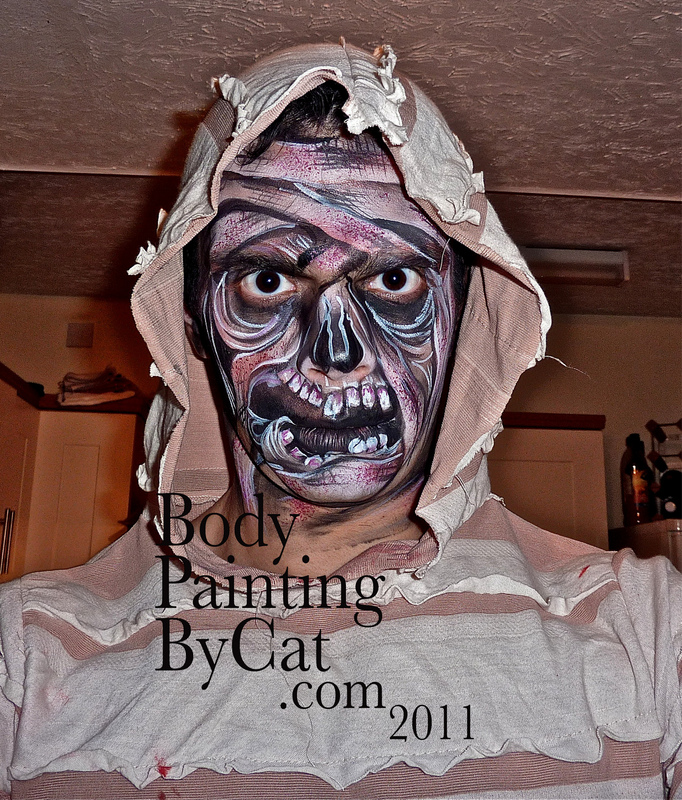 So I created a rotted flesh/ aged bandage look for his face using my usual face/ body paints. 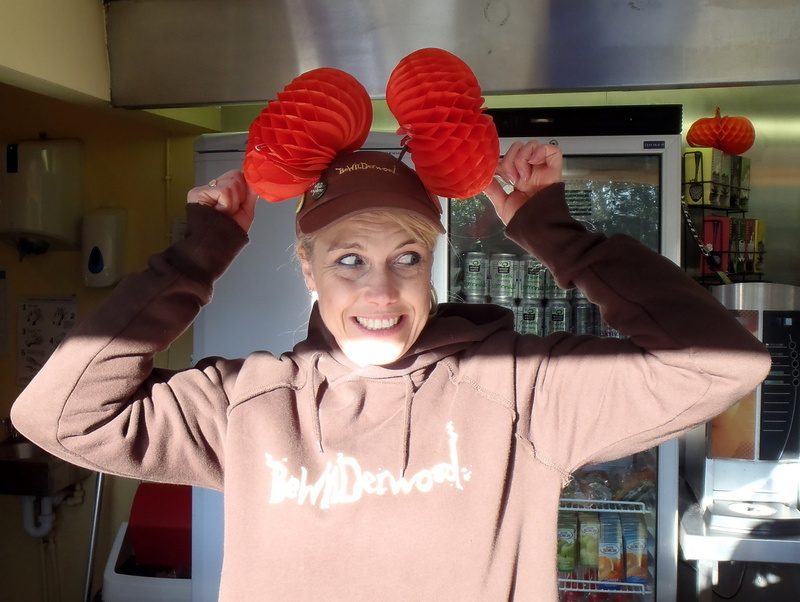 This year Josh’s partner Michelle also joined in the fun. She had a cute ‘Doll’ outfit, sort of Bride of Chucky or Death Dolly or something (possible manga or gaming??). She wanted a stitched together look so I played with my favourite Grimas burgundy to make a slashed mouth and chest with crude stitches surrounded by sore-looking skin/ bruises. She had some black contact lenses that I finished off with majorly OTT /cried-in mascara dripping down her cheeks.Their guests all make a real effort, from these photos they have kindly sent me. Looks like a great welcome & a fab event! 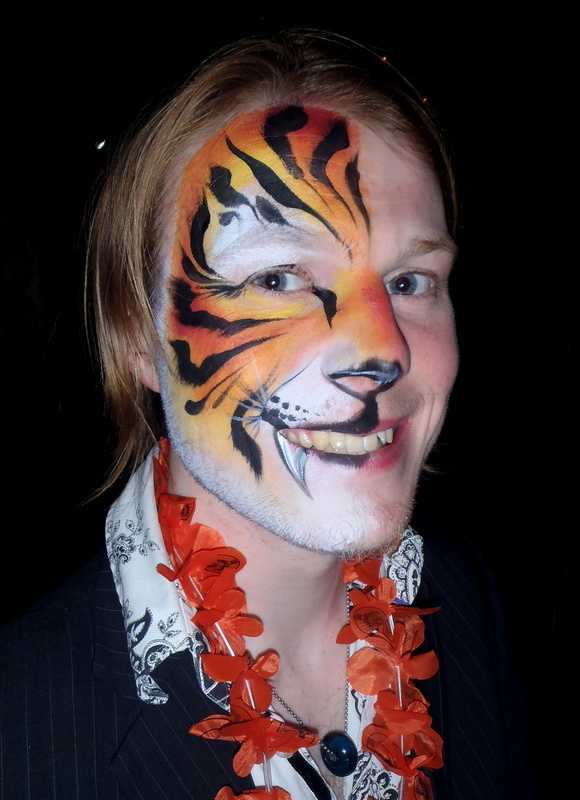 I actually 1st ‘met’ face paint when I was the Education Officer at Banham Zoo, running science lessons and giving public feeding talks. 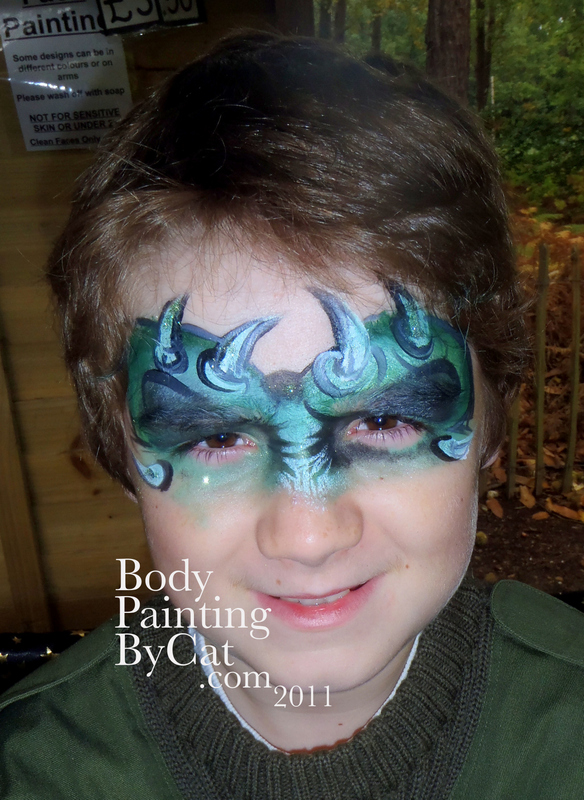 They used good paints (Grimas) but the designs and hygiene were not great and I improved loads as soon as I started researching face paint myself. 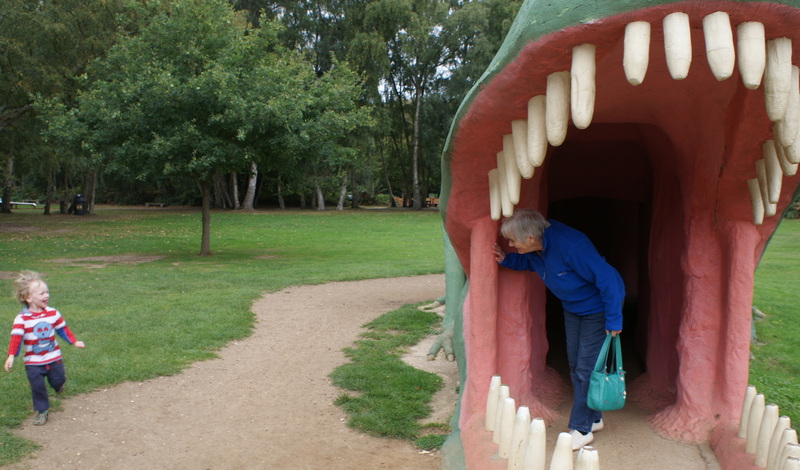 Banham Zoo is 1 of 3 East Anglian attractions owned by the same group, and after having worked in their safari park too, I always meant to visit their original site, Norfolks‘ Dinosaur Adventure Park. That was 8 years ago; we finally drove up when my mum was visiting at the end of September, and it was a really good day. You could tell which of their life-size models were older (or cheaper maybe) as some of the anatomy just looked…. – wrong. 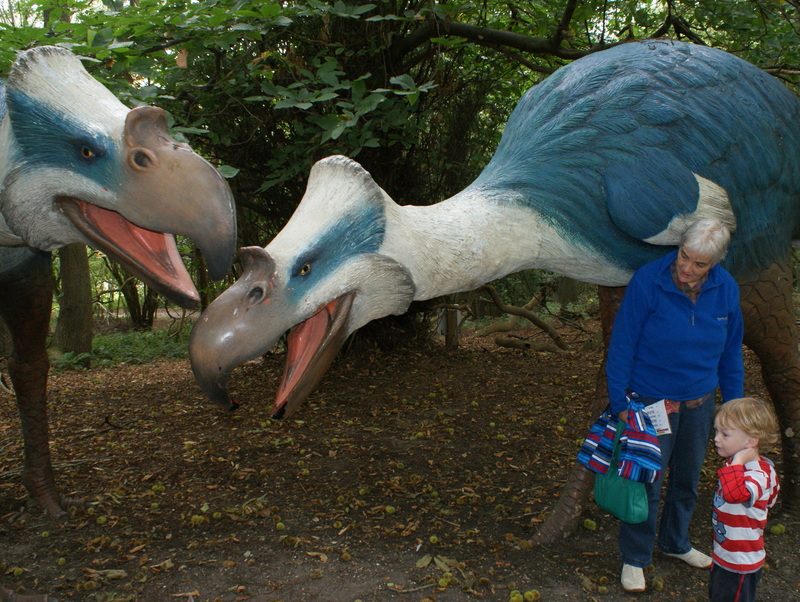 I’m not an expert – yes I worked in London’s Natural History Museum for years when I first graduated, but the Dino Gallery wasn’t my fave area in it – but some were great. 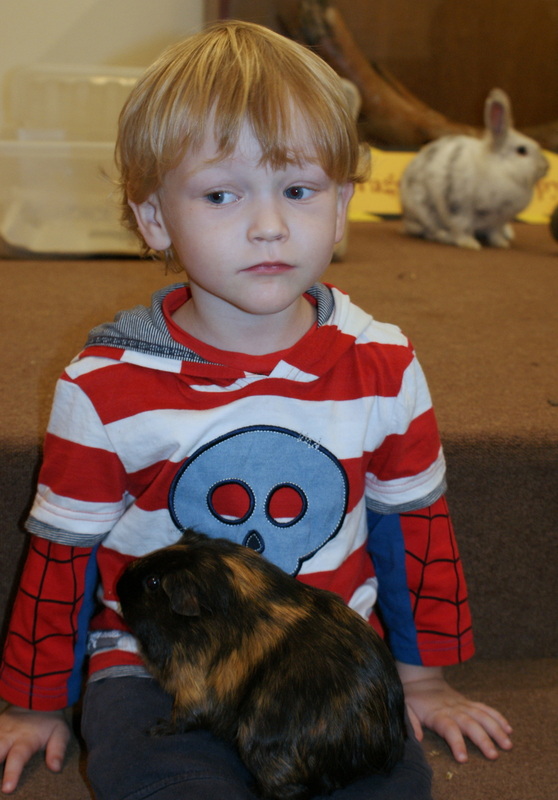 Plus there was the petting zoo (Finley got to cuddle a guinea pig, etc, he’s mainly used only to farm animals at home-check out the ‘vicious wee killer Monty Python beastie’ lurking behind him! )and all the adventure play stuff. Typically where we spent longest was on a big trampoline! 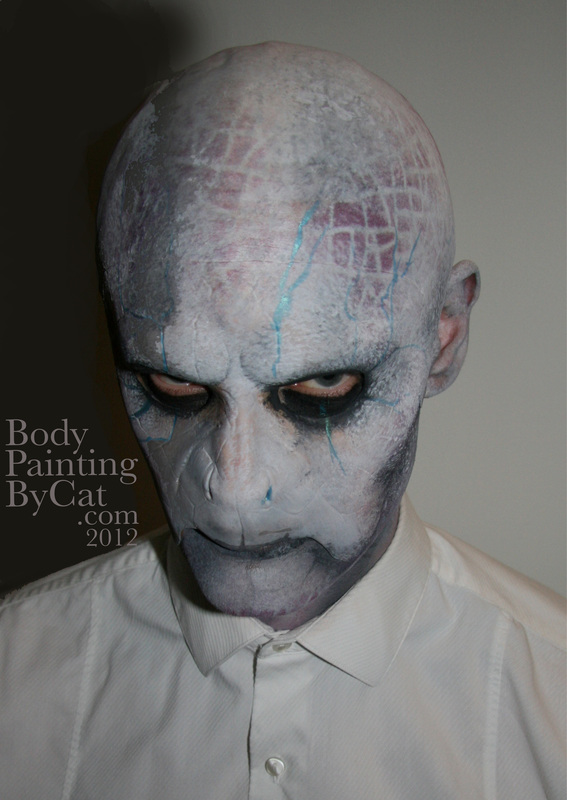 Anyway long story short, I saw they were holding a horror event in the evenings over Halloween, so I emailed asking who did their actor’s makeup. And was asked to go and run a face-paint stall there instead. 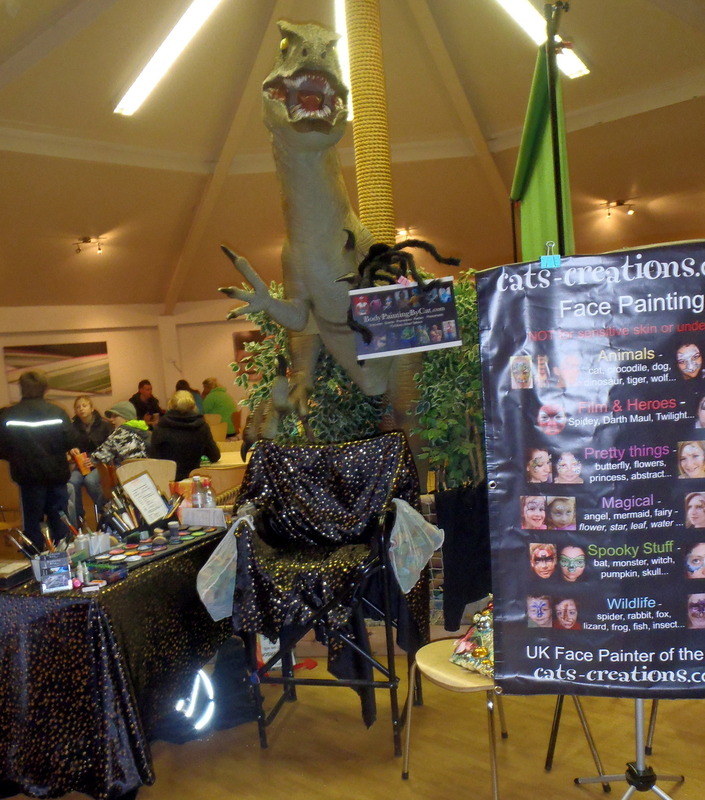 It sounded interesting, both for getting to paint things not usually on offer at my main hirer, Bewilderwood, but also to see what goes on at a Haunted House type event which they called ‘PrimEvil, Norfolks biggest Halloween Experience’. 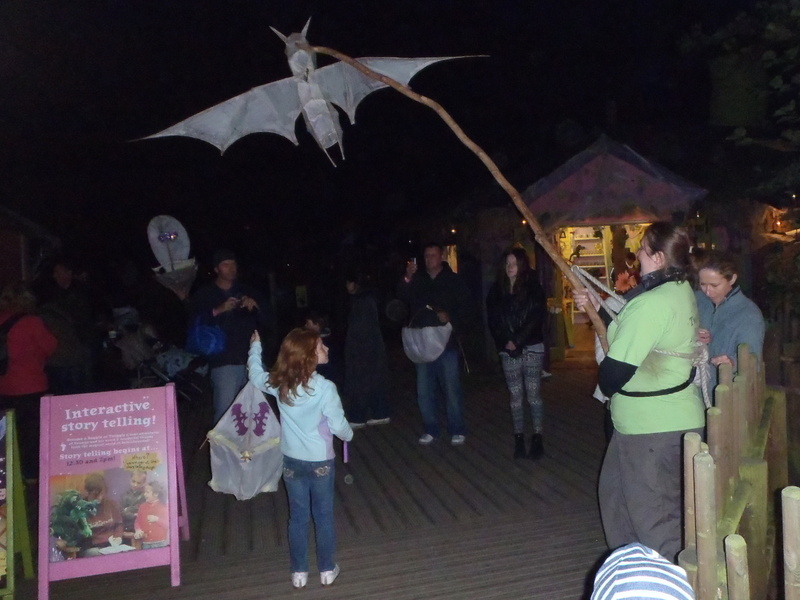 It was a bit of a rush each evening, finishing painting at Bewilderwood, packing all my gear into my car, fighting rush-hour traffic, lugging my kit back out of the car and through the queue into the Dino Park’s entrance restaurant and setting up again. I was beside some guys called Isnap Events doing green-screen on-demand photos which was a fantastic idea. People posed against the screen and then in this case could see how the looked in each of 4 spooky backgrounds (like this) and were then able to buy a print if they wished. I also tried and got addicted to chilli popcorn from Bintree Farm – which wasn’t hot enough to burn but tasted warm even when it was cold. Yum. 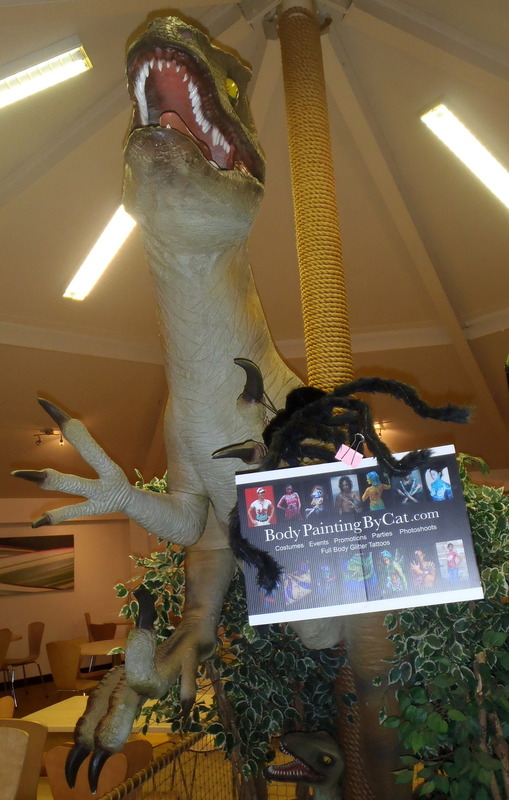 It was slightly off-putting painting with a large T-Rex looming over me (and 1 of the ladies who covered the Sat night when I was bodypainting elsewhere said she kept getting his claws in her hair) but it made the on-my-chair photos interesting:)And I did put MrT to good use! 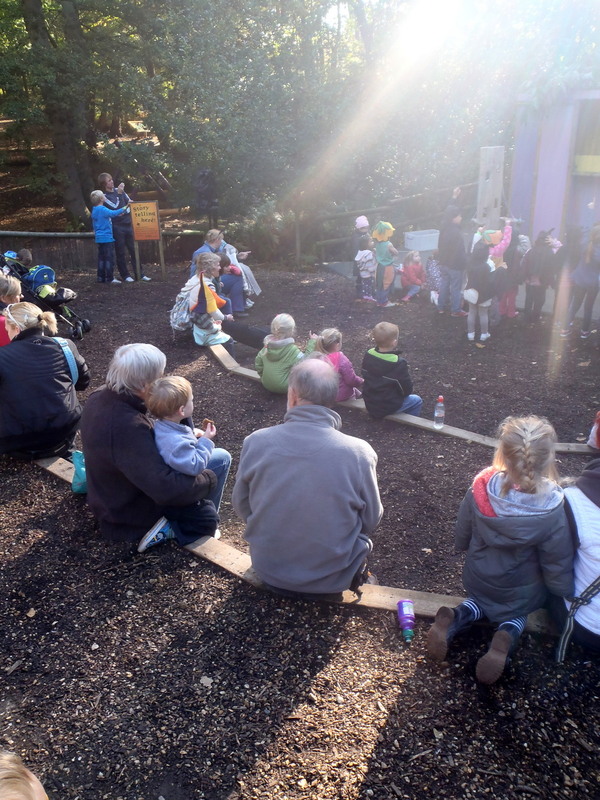 As far as I can work out, people bought tickets first of all to just the ‘free’ things – whatever was going on in the big new indoor kids play area and a long walk through the woods with actors etc leaping out at you. And animal handling sessions with bugs, snakes etc. There was also a wee fireworks show towards 9pm I think it was each night. 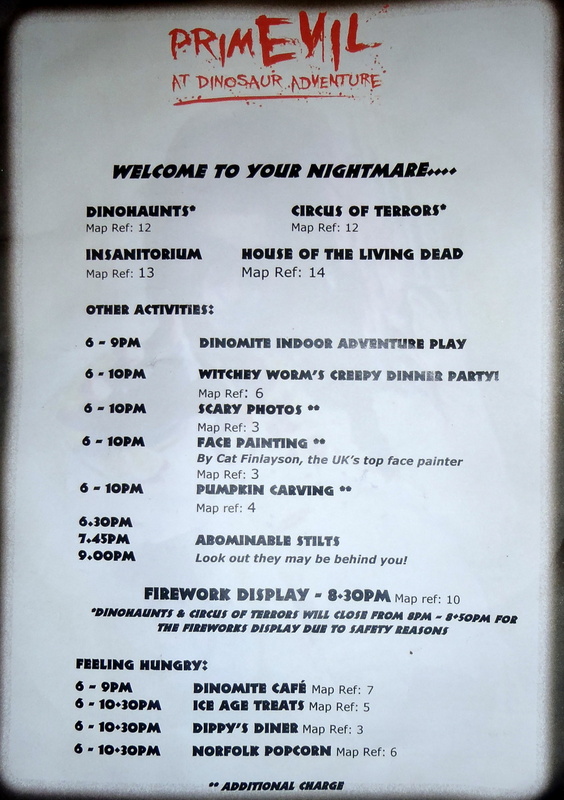 Then you could also buy extra tickets into the ‘special’ areas – there was an Insanitarium and a Circus of Horrors, also staffed with more actors, which advised no under 12’s go in. From what I heard – and the state of a few severely rattled adults/ teens who came back to the cafe to calm down or sit out the rest- it could be pretty scary. 2 Code Yellows and a Code Brown were also rumoured. But some kids were fine…I’m afraid I chickened out as I am really not great with scary stuff. I adored Stephen king, James Herbet etc books as a teen but since I had Finley I don’t seem to be able to cope with even slightly spooky films! So I painted customers and staff instead. This is my new fave gore idea – razor slashed faces. 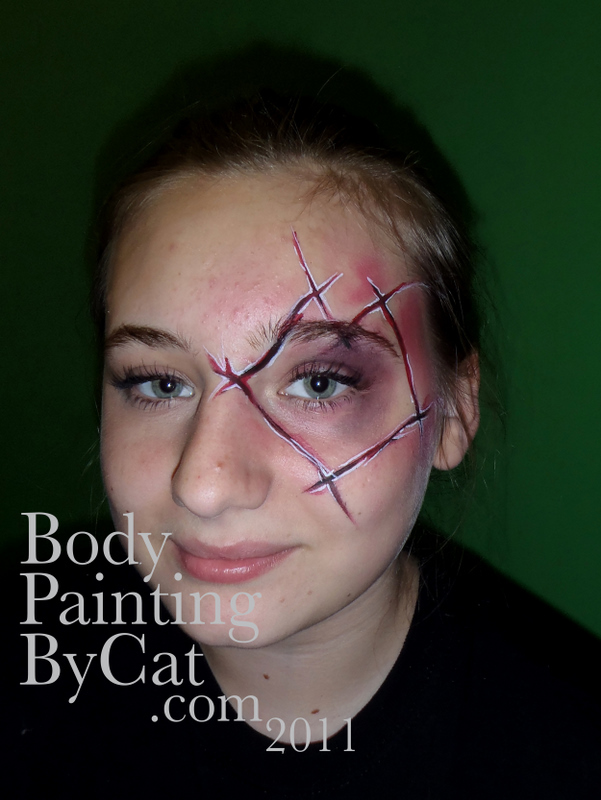 This 1 is a Bloody Valentine (heart) eye but I was doing a great line in razor-slashed butterflies too. I LOVE Grimas burgundy for this, is perfect for bruising and old blood as well as nice flowers and butterflies. I don’t have SFX kit (as said not good with scary and hate faffing around/ lugging yet more kit in) so I just use my regular paints. Got to say I reckon it’s just as good as SFX gore in some cases and probably a lot faster. Well, after that amazing spring we had a rather dull summer, so it was fabulous that most of our autumn was stunning! 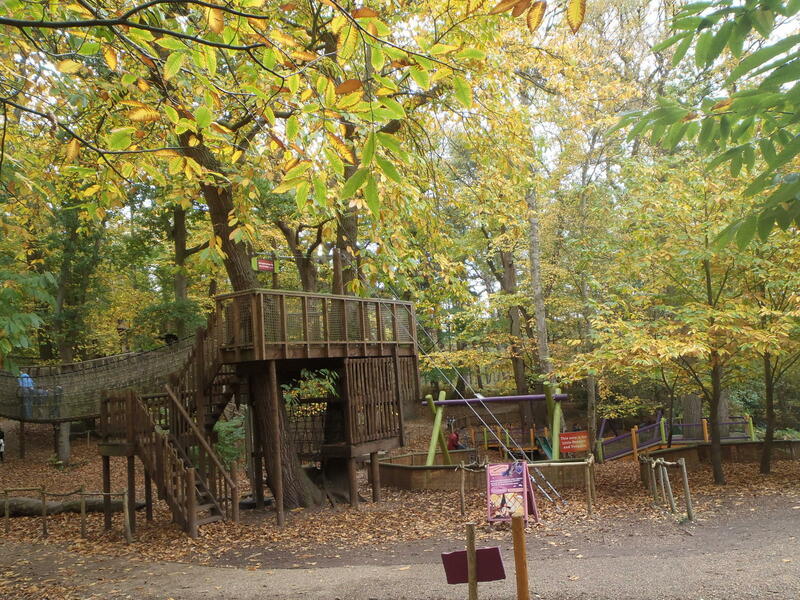 Great for me painting in my wee corner at Bewilderwood, as I still have just the temporary platform and umbrella. (I did treat myself to a new black-with gold-stars- tablecloth & chair drape, seeing us I was working at Bewilderwood and then a different event every night and will use it through Christmas as well. Mornings were cold, but as the sun is so much lower now, by lunchtime it was shining in UNDER the brolly into kids faces and usually getting me so warm I’d had to take off lots of layers. We only had 1 wet day which compared to the torrential rain and winds last year was fine! Plus I found the ‘magic’ mode on my camera which makes the early morning sun sparkle:) This is my usual view from my corner. And I think Tom Blofield (owner/ author) was a bit stumped for words for once when trying to compliment my elegant and understated Webby Witch (or batty bag, as I was told by a close friend, thanks!) outfit. 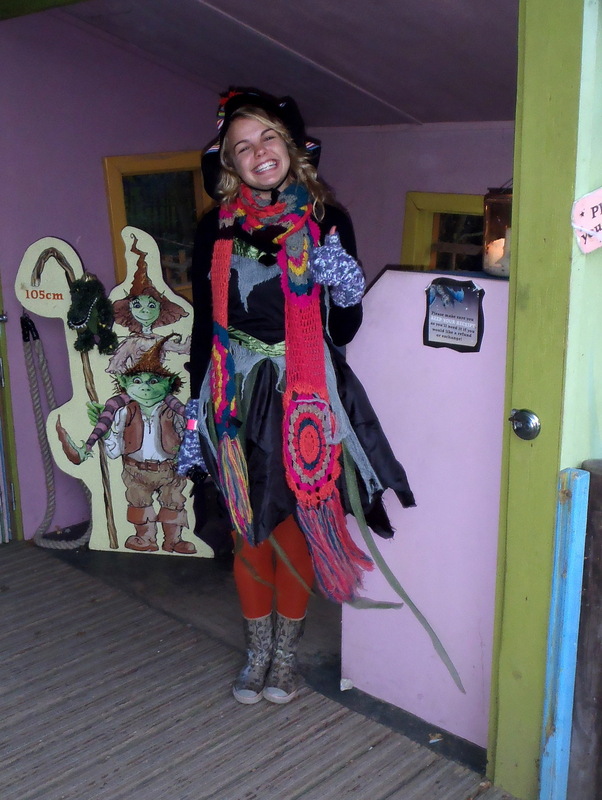 Well at least it was warm – tights, leggings, thermal socks…. 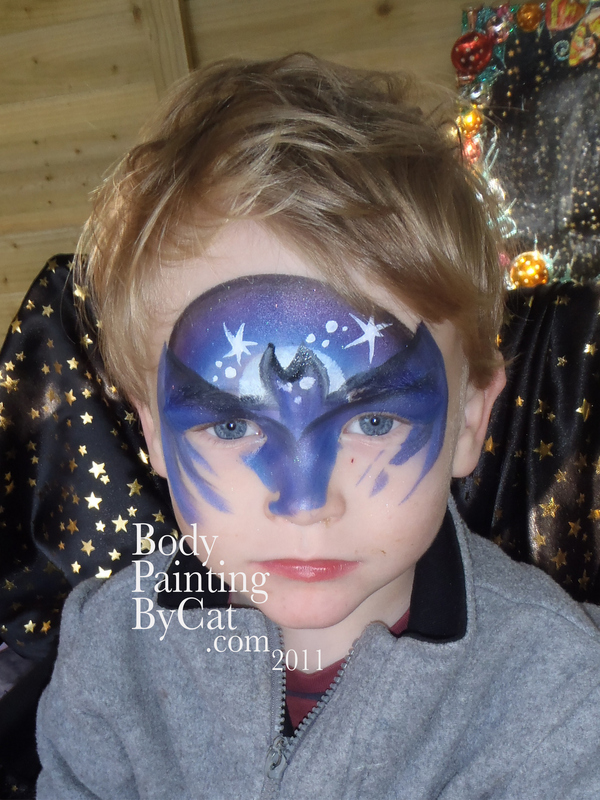 My little tiddler finally let me paint his face – well, nearly – he let me do most of the Superfast 60 second bat on him but wouldn’t let me finish off around the eyes!Every evening the park stayed open later than usual, staff rushed round lighting candles in all the lanterns and dozens of tree-hung jars. 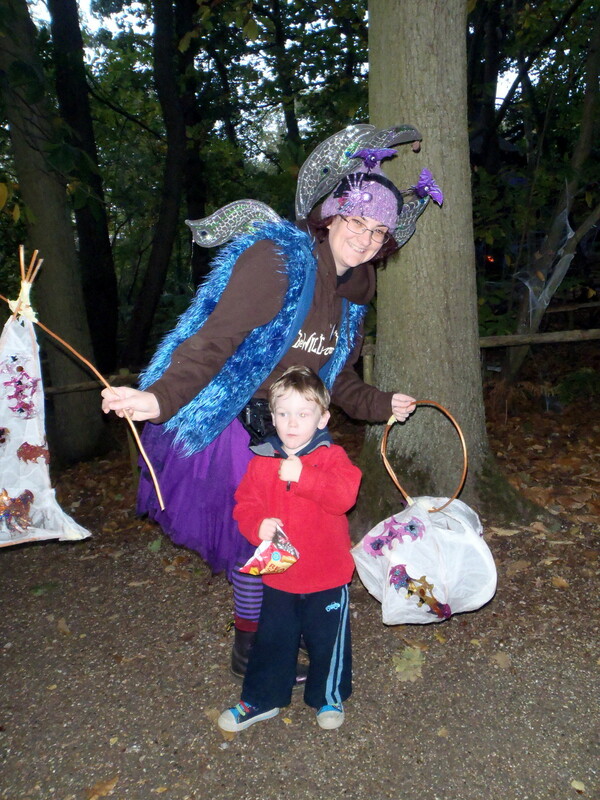 People gathered by the main cafe with the lanterns they had made for free, and then were led on a parade through the dark woods by a Snagglefang lantern.The friendly witch waved from her house and a couple of the puppets were in their places around the park. I hadn’t had a chance to make new lanterns but luckily willow & tissue is tough and mine from previous years had survived – decorated with discarded bat masks! 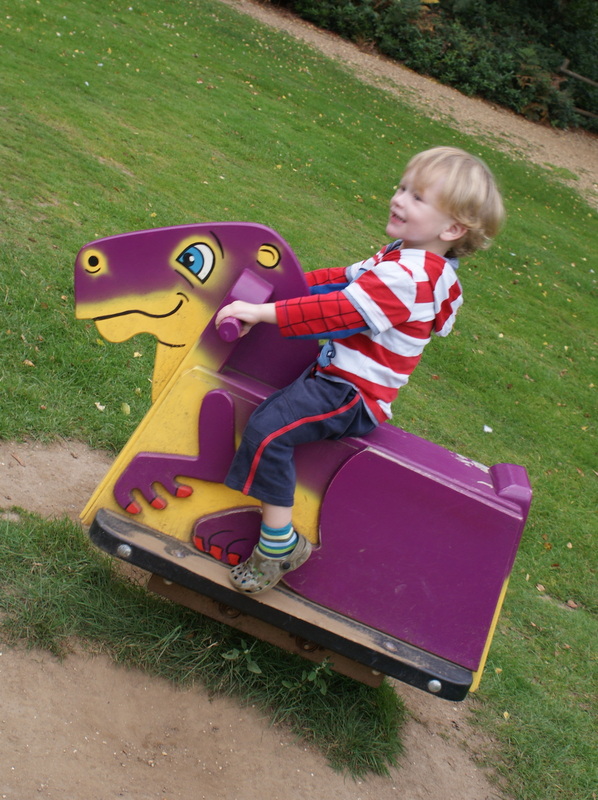 My little Finley thought it was ‘big and dark and scarey – and big’ and loved it so much we ended up doing it each of my 4 ‘free’ evenings! 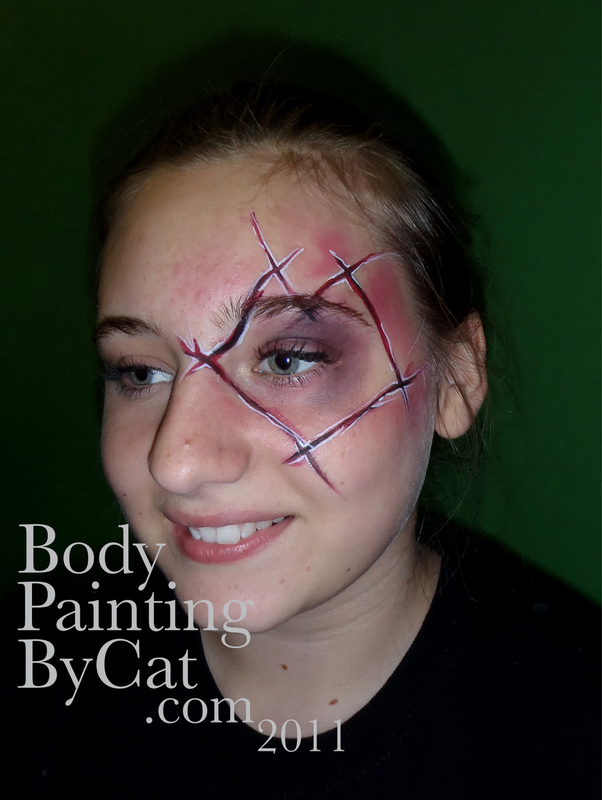 Atmospheric but pretty, really..
Book a Halloween face paint or Body paint! 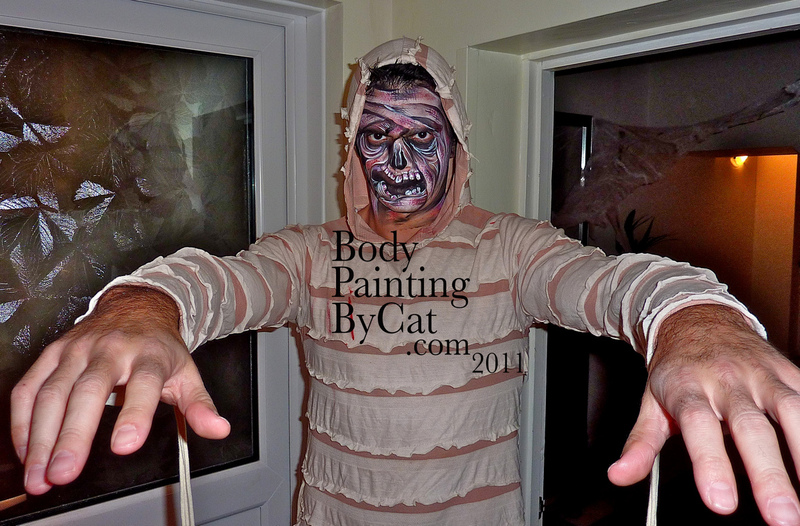 I’m already booked the entire pre-Halloween week (from Fro 21st-Sun 30th) during the DAY but some evenings are still available. And – GASP – I have no bookings at all on the actual Mon 31st as I post this! 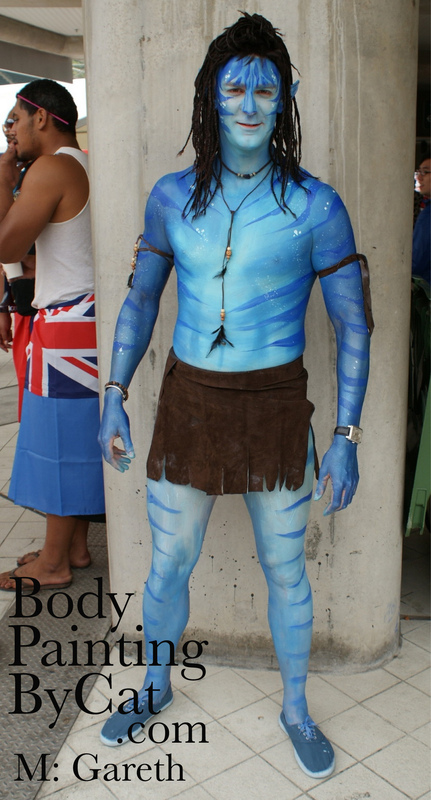 Remember, if it is a glitter tattoo or tattoo ink design I could do on you, that lasts perfectly through sleeps, showers and under clothes for several days, so could be done several days BEFORE your event if you want to maximise the ‘wear’ out of your body art. 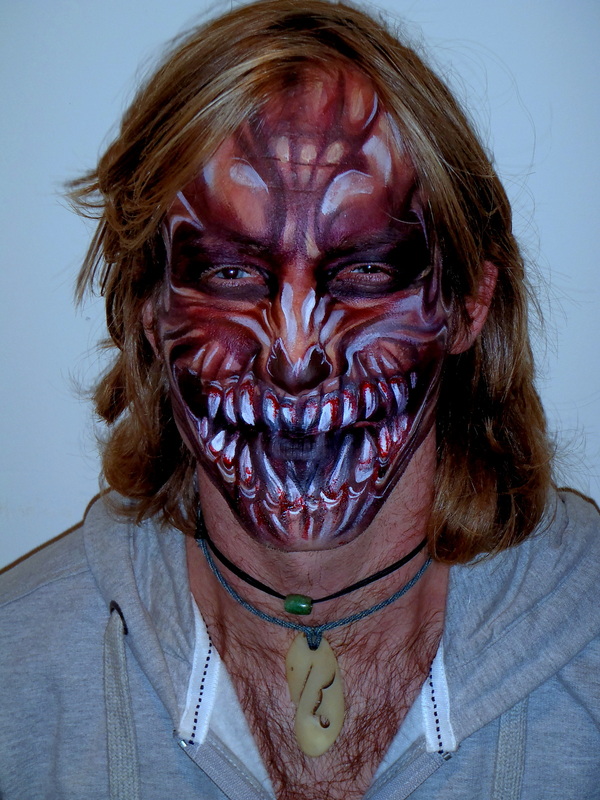 Avatar, superman, heroes, animals, skull and scary faces…. can be pretty too don’t forget!